The production of Gypsy by Porchlight at the Ruth Page Center for the Arts, represents the very best of musical theatre. Most older musicals rarely stand the test of time in terms of content, their stories often saddled with the most cringeworthy stereotypes and one-dimensional female characters. In contrast, Gypsy, originally written in 1957, may have been is ahead-of-its time. Inspired by a true story about an ex-stripper turned stage-mom, it still pushes boundaries even in 2018. Pair that with a sophisticated book and lyrics by powerhouse duo Sondheim and Laurents, and a megawatt star like E. Faye Butler, and you’ve got yourself one hell of a show. The complex and bawdy role of Rose has been played by greats such as Ethel Merman, Bernadette Peters, Patti Lupone, and Angela Lansbury, and Butler steps into the shoes with ease and grace, sending the audience on a roller-coaster ride of laughter and emotion. The term “tour-de-force” is bandied about far more than necessary, yet here Butler earns the moniker. From the moment she emerges, her presence claims the room. And when she opens her mouth to sing – brace yourself as the heavens break open with triumphant glory. Women’s roles in musical theatre are often thin shadows of human beings, either mewling love interests or mirrors for their male counterparts with no substance of their own. However the role of Rose is one of the meatiest in the canon. She is not only a strong female character, she veers at breakneck speed into the terrain of unapologetic defiance; breaking the strict confines of what a mother’s love looks like. Many women go their entire careers without the opportunity to flex the full range of their talents, and witnessing Butler run the gamut of levels with the solid chops of a veteran actor is a sight to behold. Casting Rose as a black woman adds a level of deliciousness to the story for anyone who has had the pleasure of having been raised by, or is friends with, a certain kind of black woman. The experience of having an unconventional mother is a universal one, and non-traditional casting extends the tent of belonging in a beautiful way. Director Michael Weber takes this notion one step further, by casting all of the main characters in the story as people of color. Taking in the experience feels bold and radical, even though it shouldn’t. After all, people of color and other marginalized groups regularly experience ourselves reflected onstage and in media only in bit roles – if at all. One hopes that a day will soon come when diverse casting choices no longer feel like a decadent indulgence or a political statement, and are simply another night of amazing theatre that audiences of any background can enjoy fully. Jose Antonio Garcia makes a perfect pair as Herbie, the love interest. His easy, jovial disposition and wry smile complements Rose’s intensity. And their voices blend sweetly like honey and milk while singing Sondheim’s exquisite lyrics in “Small World.” If this powerhouse pair wasn’t already enough, a small battalion of ridiculously adorable and talented children threaten to steal the show, led by the outrageously precious Izzie Rose who plays Baby June. Oh, and did I mention that there’s also a puppy in the show? Across the board, every element of the musical is spectacular. Michael Weber’s elegant staging is highlighted by the simple and stunning set (Jeffrey D. Kmiec) The band led by music director David Fiorello is absolutely magnificent, and the jokes crackle and pop with lively energy. The only false note in the whole piece is an outdated bit about flamenco dancers that could be easily reimagined without the yipping “ay-yi-yi’s” that hit more icky than funny. Comedy is not evergreen, and the crude gag of portraying racism comedically with the intent of illustrating that it is wrong is, in most instances, years past its expiration date. Fortunately, great entertainment never expires, and this production is fresh and fun. 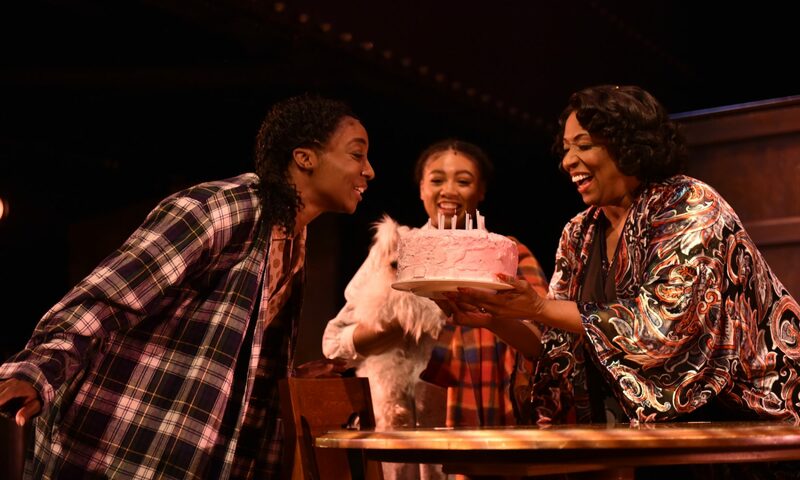 Gypsy at Porchlight is one of the best shows you will have the opportunity to see this season, and you would be remiss if you didn’t let Mama Rose show you what real showbiz is all about. Gypsy produced by Porchlight Theatre runs until November 25th at the Ruth Page Center for the Arts. Featuring: E. Faye Butler, Saniyah As-Salaam, Larry Baldacci, Joshua Bishop, Dawn Bless, Elya Faye Bottiger, Tatiana Bustamante, William “Pierce” Cleaveland, José Antonio García, Jillian-Gisele, Jared David Michael Grant, Daryn Whitney Harrell, Michael Huey, Hannah Love Jones, J. Michael Jones, Marvin J. Malone II, Desmond Murphy, Renellé Nicole, Jeff Pierpoint, Izzie Rose, Aalon Smith, Ariel Triunfo, Marco Tzunux, Honey West, and Melissa Young.